An LED wooden wall plaque to give you a warm greeting when you enter your home. 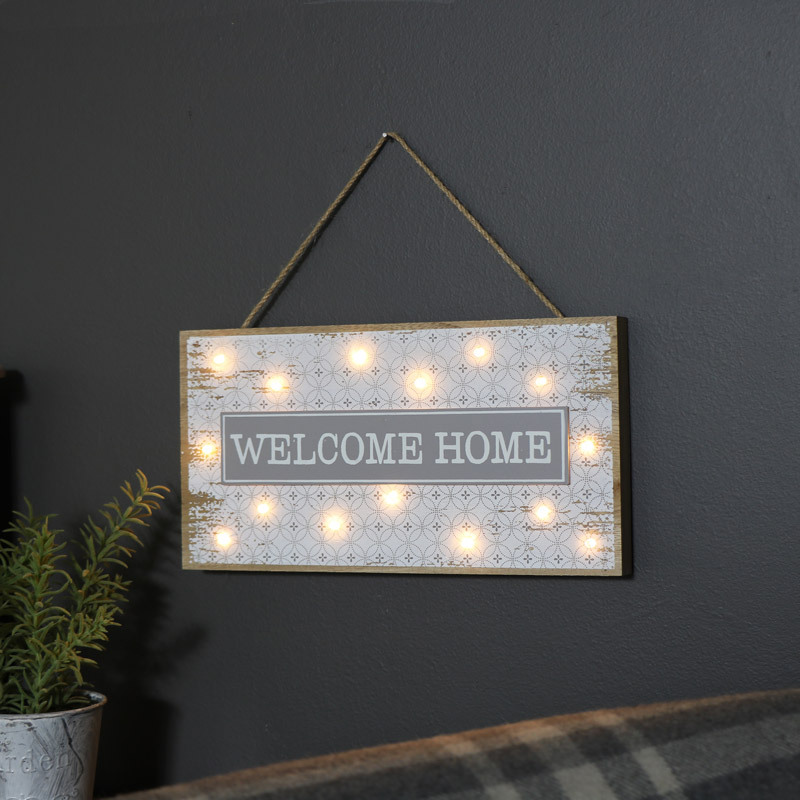 The plaque reads “Welcome Home” in bold white writing on a grey back ground to make really make it stand out. The wooden frame and distressed white patterned centre add a rustic country charm and can be suspended from the wall on twine which is attached to the top of the plaque. With 15 LED bulbs built into the canvas and surrounding its printed quote it is bound to catch eyes with its warm white lights. 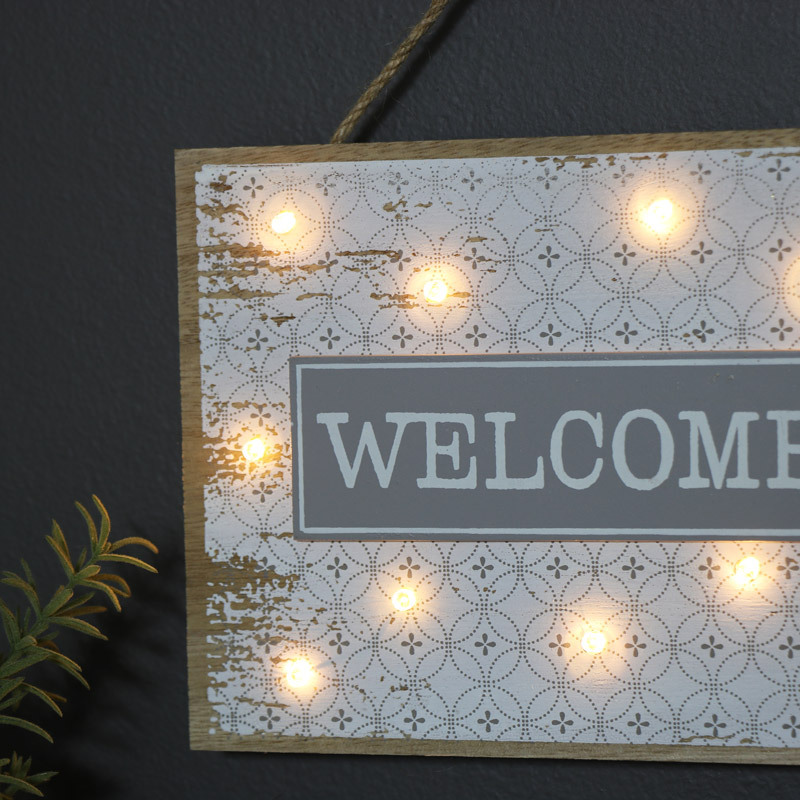 An LED wooden wall plaque to give you a warm greeting when you enter your home. The plaque reads “Welcome Home” in bold white writing on a grey back ground to make really make it stand out. The wooden frame and distressed white patterned centre add a rustic country charm and can be suspended from the wall on twine which is attached to the top of the plaque. With 15 LED bulbs built into the canvas and surrounding its printed quote it is bound to catch eyes with its warm white lights. This plaque takes two AA batteries (not included) and can easily be hung from the wall with the rustic twine attached. With a huge range of plaques, from inspirational to humorous, wooden to metal and girly to rustic. Plaques make a great addition to the home but also make fantastic gift ideas.